A system of parishes, units of ecclesiastical administration and pastoral care, evolved during the middle Anglo-Saxon period and by the end of the 12th century it existed in most parts of the country. From the Middle Ages, when England had some 8,500 parishes, until the late 19th century, the parish was the basic territorial unit in the organisation of the country and the responsibility for local administration was gradually extended by Parliament to include, for instance, the raising of local rates and taxes. It was important for people to know what parish they lived in and where the boundaries were. Parish boundaries were historically marked by stones, and later by cast iron, sheet metal or lead plaques which were displayed at public locations, commonly on the walls of buildings, but also on boundary walls, where they were visible to every passer-by. The oldest of the four still extant boundary stones in Norwich dates from 1710 and is shared by the two parishes the boundary of which it marks: 'SPM' and 'SG', St Peter Mancroft and St Giles respectively. It still is in its original location, as are two others, both dating from 1772. 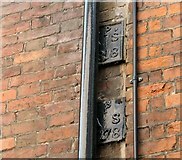 While the lead plaques used by some of the Norwich parishes have a unique shape which is recognisable at first glance, most are rectangular. All bear the initials of their parish - for instance the letters 'PSE' for Parish of St Etheldreda, or the letters 'SPM' for St Peter Mancroft, and the date (year) they were issued. Following the fashion of the time, the letter 'J', however, was commonly expressed with the letter 'I', and for this reason the plates used by the Parish of St Julian bear the legend 'PSI', and the markers for St John Maddermarket read MSI (Maddermarket St John), with the one exception being the oval boundary markers used by the Parish of St John Timberhill, which read 'St.J.T.H.'. In addition to initials and year of issue, some plates also display the symbol of their parish's saint, for instance Saint Andrew's saltire cross, St Lawrence's grid iron or St Clement's anchor. A closer examination of the examples held at the Bridewell Museum reveals that some of the plates are stamped with a Roman numeral, the meaning of which is not clear, on the reverse. Every year the boundaries were authenticated by processioning round them. The roots of parishes affirming their boundaries by this method, usually at Rogationtide (in the month of May), can be traced back to ancient times, and certainly to before the days of Christianity: after a major earthquake in 470 AC in plague-ridden Vienne, France, for instance, bishop Mamertus ordered litanies to be said in solemn procession through the fields. In 511 AC, the tradition was extended to the whole of Gaul. 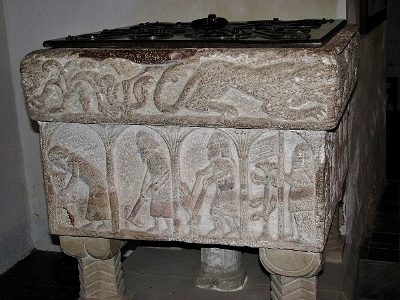 A Norman baptismal font in St Mary's church in Burnham Deepdale and dated to around 1100 depicts a male figure holding a boundary-marking flag pole (of the four figures depicted on the font's panel, it is the one at the far right - photo © E Simak). In England, the custom was officially adopted in the early eighth century and became known as the Beating of the Bounds or Perambulations, and it has since been carried out for many centuries in the parishes of England and Wales (in Scotland the tradition is known as Riding the Marshes) as a method of reaffirming the parish boundaries from before the introduction of maps. In the city of Norwich, the historic boundary line can often still be found, and followed, but perhaps not along the 250-metre stretch running in the middle of the River Wensum (although an old photograph taken in 1913 in Hungerford depicts parishioners walking along their boundary situated in the middle of the River Thames). 1854 was the last year for any Norwich parish to beat its bounds. Not only specific locations but on occasion whole areas, in particular in the parishes of St Saviour and St Augustine in the north of the city, have since undergone significant transformations. In April 1942, Norwich was subjected to enemy air raids which left much of the south-western core of the city in ruins. Many buildings were destroyed and St Stephen’s Street, for instance, was devastated, and in 1953 the street was widened on the east side with all buildings standing in the way being demolished. An old stone marker was lost during the Blitz when a bomb hit Lower Square off Thorn Lane in the Parish of St Michael of Thorn, the church of which was later demolished and this area, like a number of others, has since been completely transformed. A great number of buildings were demolished in later years to be replaced by modern structures such as at Anglia Square on Magdalen Street, built in the 1970s. New roads were constructed, and existing roads widened, frequently also involving the demolition of buildings. Some of the city's old yards have completely disappeared. In the course of new building and road construction schemes many of the old parish boundary markers have disappeared, although some, at least, were rescued and are now kept in the Bridewell Museum for safekeeping; others were reset near their original locations. 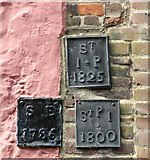 In addition to the majority of the currently extant lead plates, three boundary stones also have survived in situ, the oldest record in existence is a marker shared by the two adjacent parishes of St Margaret and St Giles and dating from 1710. The oldest metal plate, now in the Bridewell Museum, comes from the Parish of St Michael and All Angels (St Miles) and dates from 1729. The most recent plate, from the Parish of St Benedict, dates from 1854, which was the last year for any Norwich parish to beat its bounds. In all, about 40 metal boundary marker plates are being kept in storage at the Bridewell Museum in Norwich, and two are on display. There is no obligation for property owners or local authorities to maintain or preserve parish boundary (or other administrative) markers unless they are attached to a listed building. Mention in a survey, a book or a local list are no guarantee for survival, and there is evidence that, sadly, the loss of some stems from ignorance or carelessness. The fact that approximately half of the city's historic boundary plates would seem to have been lost within the last 80 or so years does not bode too well for the survival of the specimens still in situ today. Of the 195 boundary markers recorded by Joseph Edward Read (an antiquary from Lakenham, 1851-1936) in his survey carried out between November 1934 and March 1935, less than half - four stones and 79 metal plates - are still in place in the city today (2018), albeit not all of them still at their original locations, and while the Bridewell Museum has at least one example of most of the extant plates and several of which no example is left on a city wall, it would seem that about 60 are now irretrievably lost. Sadly, no plates would seem to have survived from the parishes of St James Pockthorpe, the Hamlet of Pockthorpe, St Martin at Palace and St Paul, but fortunately Joseph Read photographed at least some of them (see below). 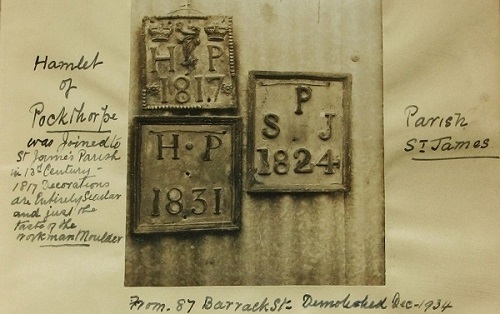 For instance, the plates seen in the old photograph at left (© JE Read, courtesy NRO) taken by Joseph Read in 1934, which were handed over to the owner of a property at 87 Barrack Street scheduld for demolition - the location was immediately adjacent to the city wall by the junction with Water Lane, now River Lane - have not been seen ever since. Today there is of course no longer any need for boundary markers, nor of confirming the boundaries with a ceremony for administrative reasons, as parishes and other administrative areas are now marked on the Ordnance Survey maps. For an inventory of all extant parish boundary markers in the city of Norwich in the summer of 2018, with the addition of some unique plates kept at the Bridewell Museum, listed by parish, in alphabetical order, see below. The exact number of plates in private ownership is not known, but as they are no longer in situ, they are not included in this survey. The Parish of All Saints is grouped around Surrey Street in the south-west of the city, and adjacent to the Parish of St Michael at Thorn in the west and to St John the Baptist Timberhill in the north-west and north. Norwich All Saints was consolidated with St Julian and St Edmund in 1706. By Order in Council of 8 June 1929, St Julian was united with Norwich St Peter Parmentergate, and in 1953, St Julian was amalgamated with St Peter Parmentergate. The parish church > Link is situated at Westlegate, the northern end of All Saints Green, and only a short distance away from the castle and the market place. It was closed in 1973, is in the care of the Norwich Historic Churches Trust and currently houses an antiques centre and a tearoom. 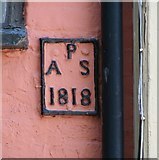 The plate is situated on the wall above the Adnams shop in the Aviva (Norwich Union) Building > > Link and marks the boundary of the parish of All Saints. It dates from 1818. The plate was originally mounted on the front of Evans' bicycle shop. See also my article: Link . 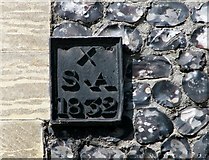 This plate marks the boundary of the parish of All Saints and dates from 1818. For a full view of this house see > Link . 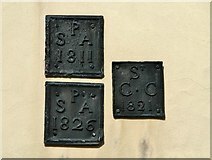 Both plates mark the boundary of the parish of All Saints, and date from 1818 and 1778. 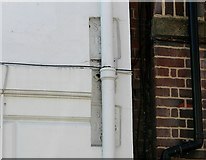 They are mounted on the north gable end wall of the property > Link and obscured by a drainage pipe. One plate originally from 7 Westlegate, 1778, is in the Bridewell Museum. The Parish of St Andrew shares its western boundary with St John Maddermarket and the parishes of St Peter Hungate and St Michael at Plea in the east. The northern parish boundary runs in the middle of the River Wensum. It was a wealthy parish and the parish church > Link was situated on what used to be the main route from the market to the cathedral, now St Andrews Street. It is noteworthy for its collection of 16th century stained glass and its Elizabethan and Jacobean monuments. The letter 'X' on this parish's boundary marker plates represents the saltire cross, also called St Andrew's cross, and is the symbol of Saint Andrew, who was crucified on a cross of this type. The older plates have a unique shape used only in this parish. There are four marker plates > Link on the corner of this property. The two plates depicted here face west and mark the boundary of the parish of St Andrew. They date from 1813 and 1832. (The other two plates face south and represent St Peter Hungate.) For a wider view of this location see > Link . 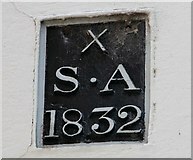 This plate marks the boundary of the parish of St Andrew and is dated 1832. It is situated by the junction of School Lane and Bedford Street. 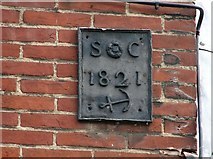 This marker plate can be seen on the north-east buttress of Blackfriars Hall > Link . 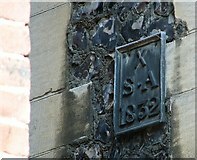 It marks the boundary of the parish of St Andrew, the year is 1832. (The 'X' represents a saltire cross, the symbol of Saint Andrew, who was crucified on one.) For a view of the church and some information see > Link . This plate is well concealed high up by the south-east corner of the building but can be glimpsed, albeit from just the right angle, when walking down Elm Hill from Princes Street. It marks the boundary of the parish of St Andrew and dates from 1832. Blackfriars Hall > Link is part of St Andrews Hall, a former Dominican friary, and Grade I listed. This is the most northerly parish within the city walls and is bounded by the parishes of St Paul in the north-east, St Saviour in the south-east, St George Colegate in the south and part of St Clement in the west. The parish was grouped around St Augustine's, Botolph and Pitt streets but was later united with various neighbouring ones (St Mary Coslany and St George Colegate) and finally with St Luke in Aylsham Road. The parish church > Link contains a number of WW1 memorials including one to a soldier shot for desertion in 1917, and is situated on the eastern edge of an open space known as Gildencroft to the north of the city’s inner ring road (A147) and west of Pitt Street. It has been redundant since 1997 and is in the care of the Churches Conservation Trust. St Augustine is the only church in the city which has a red-brick tower (dating from the 17th century). The two plates at left mark the boundary of the parish of St Augustine and date from 1811 and 1826. The plate at right represents the parish of St George Colegate and dates from 1821. For a wider view of this location see > Link . One plate from 92 Calvert Street, 1826, is in the Bridewell Museum. St Bartholomew, Heigham, situated a short distance west of the city centre, is the only parish outside the city walls to have used parish boundary markers and only one plate would seem to have survived, albeit not in its original position. The parish church > Link was situated just south of Heigham Street and destroyed on 27 April 1942 during the first of the Baedeker raids. The ruined tower has, however, been preserved and the area surrounding it is now a public park. 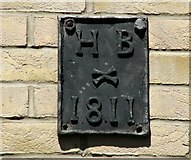 This plate was reset to its present location from a property in the vicinity which was demolished to make way for the ring road, and dates from 1811. The letters 'H' and 'B' stand for the parish of Heigham St Bartholomew and the crossed knives below the letters are the symbol of Saint Bartholomew who was flayed alive. The plate is unique in that it is the only one of its kind marking a parish outside the city walls. See > Link for a wider view of this location. This western-most parish within the city walls is adjacent to the parish of Heigham (outside the city walls) in the west and shares its southern boundary with St Peter Mancroft and its eastern boundary with St Swithin parish. The parish church > Link was destroyed by bombs in January 1942 but its round tower remains and today is a focal point on the West Pottergate housing estate. 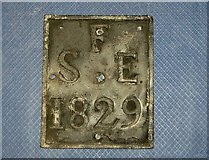 This plate dates from 1854, which is also the latest date of any extant boundary marker plate still in its original position. The letters P-S-B stand for the Parish of Saint Benedict. Only the tower of St Benedict's church > Link remains still standing, surrounded by security fencing for health and safety reasons. See > Link for a wider view of this location. One plate, original location unknown, 1854, is in the Bridewell Museum. The Parish of St Clement is situated just north of the River Wensum and bounded by the Parish of St George Colegate in the west and St Edmund Fishergate in the east. The Parish of St Saviour is adjacent in the north. The parish church > Link is situated by the junction of Colegate and Magdalen Street and was one of the first churches built north of the river in the 15th century. It became redundant in the late 1960s, is in the care of the Norwich Historic Churches Trust and currently home to the Guild of Stonemasons. 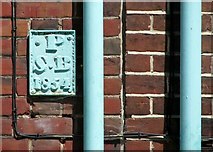 Three parish boundary markers are hidden behind the drainpipe of The Merchants of Spice restaurant > Link which used to be known as the Black Boys Inn. The top and bottom markers both represent the parish of St Clement and date from 1809 and 1821. Part of Saint Clement's symbol, the anchor, can be discerned. The plate in-between the two marks the boundary of St George Colegate and dates from 1821. The two plates at right mark the poundary of the parish of St Clement (the anchor was his symbol) and date from 1809 and 1821. 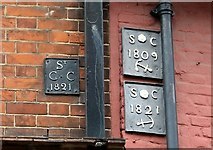 The smaller plate at left, technically at 21 Colegate, marks the boundary of St George Colegate and dates from 1821. For a wider view of this location see > Link . This plate marks the boundary of the parish of St Clement and dates from 1821. 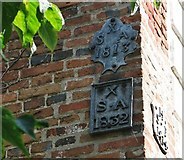 The anchor at bottom is the symbol of Saint Clement and can be seen on all the boundary marker plates of this parish. For a wider view of this location see > Link . This small parish north of the River Wensum is surrounded by the parishes of St Clement in the west, St Saviour in the north-west, St Paul in the north and the River Wensum in the south. Its name derives from the many fishermen who lived there. There used to be a watering or water gate at the south-west corner of the churchyard where the fish they caught were landed. The parish church > Link has been disused since before the 19th century but is still intact and in the care of the Norwich Historic Churches Trust. The current tenants are Call to Prayer. This plate once marked the boundary of the parish of St Edmund Fishergate and dates from 1829. It came from the garden or courtyard of Gurney Court off Magdalen Street, where the Gurney family used to live and where Harriet Martineau and the Quaker prison reformer Elizabeth Fry were born. No other plates from this parish are known to have survived at their original locations and the plate depicted here is kept at the Bridewell Museum in Norwich for safekeeping. It is one of two surviving examples (the other dating from 1800 and also in the care of the Bridewell Museum) from this parish. The Norwich photographer George Plunkett has photographed one of the parish's plates in March 1936 at its original location in Thoroughfare Yard (off Magdalen Street) > Link which in its original state also no longer exists. The other two plates represent the neighbouring parish of St Clement. See also > Link . The Parish of St Etheldreda is situated between two parts of St Julian parish in the north and in the south, and is bounded by the River Wensum in the east. The parish church > Link is redundant and in the care of the Norwich Historic Churches Trust. It has for many years now been used as artists' studios. The plate at left marks the boundary of the parish of St Etheldreda and dated from 1786. Despite the different lettering, both the plates at right represent the parish of St Julian. Following the custom of the time, the letter 'J' is expressed as 'I'. The plates date from 1800 and 1825. For a wider view of this location, the house where John Caius used to live, see > Link . The bottom plate marks the boundary of the parish of St Etheldreda. Despite the different lettering, both the plates above it represent the parish of St Julian, with the lettering following the custom of the time spelling the letter 'J' like an 'I'. They date from 1789 and 1825. See > Link for a wider view of this location.